From a Roman town to the birthplace of 16th century conquistadors, and the capital of Extremadura from then until the 18th century, Trujillo’s historical journey has earned it honorable titles, such as the Very Noble, Very Loyal, Distinguished and Very Heroic City, and its monuments have been considered a Cultural Asset of National Interest since 1962. Famous names from Trujillo include Francisco de Orellana, who discovered the Amazon River, and Francisco Pizarro, who ordered the construction of the church and chaplaincy, building the Palace of the Pizarro as reminder of the Extremaduran origin of one of the last advances in American territory of the then-Spanish empire. The Spanish emigrants brought over a wealth of heritage from the Americas, and not only built palaces and stately residences, but also collaborated on the construction of chapels and hospitals, buildings we can still enjoy as we wander through the city’s intricate narrow streets. The architectural discretion of this monastery and the adjoining Royal Room where Emperor Charles V stayed contrast with its worldwide fame, which reached an almost mythical status in Modern Age culture as the place where the Emperor spent his final months, and was portrayed in countless works. 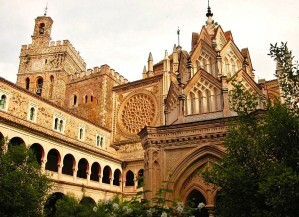 The San Jerónimo de Yuste Monastery was built at the beginning of the 15th century, with a Gothic and a Renaissance cloister, portraying the change in the era’s styles. The Royal Room, built by Gaspar de Vega in the mid-16th century according to the Emperor’s instructions, is marked by the simplicity and logical distribution of a religious retreat, located alongside the church altar under which the Emperor asked to be buried. His body remained there until his son, Philip II, had it transferred to the Royal Monastery of San Lorenzo de El Escorial. Extremaduran heritage has been updated with two singular contemporary art projects. The first, and most recent, is the Helga de Alvear Center for Visual Arts Foundation, created by gallery owner Helga de Alvear, who decided to share her collection with society, setting the standard for a project aimed at dissemination, production, research and education in connection with contemporary visual creation. The second venture, the Vostell Malpartida Museum, is an unprecedented project in Spain where you can discover the art owned by Vostell, a Spanish-German artist who played a key role in post-war contemporary art. This includes his collection Fluxus, in an old wool washhouse in Los Barruecos, a magnificent site which was declared a Natural Monument, where art mixes with the natural beauty of large granite rocks, a beautiful dam, rich fauna and expansive vegetation. Monfragüe National Park, located in the heart of the province of Caceres, is, without a doubt, a privileged spot to bird watch and one of the best representations of Spain’s Mediterranean mountain ecosystem. Slopes and valleys densely covered by forests and scrub; highlands which lead up to fells and rocky ridges where griffon vultures and Egyptian vultures nest; and flatter areas that open onto extensive meadows and farms with Holm and cork oak trees, providing a clear example of the sustainable farming of the Mediterranean mountains… Deer, wild boar, badgers, genets, bobcats and otters are all found here, in addition to different species of amphibians and reptiles. Monfragüe and Doñana National Park, the protected natural reserve best known for its bird watching, are unequalled on the entire continent for their wide variety and dense populations of both Rupicola and forest raptors. Built in the mid-14th century, the Royal Monastery of Santa María de Guadalupe is a splendid combination of diverse building styles and techniques. Located in Caceres, Extremadura, this monastery played a key role in Spanish history: this is where Christopher Columbus convinced the Catholic Monarchs to support his expedition to the Indies, which ended in his discovery of America in 1492. Queen Isabella I of Castile was profoundly devoted to the Virgin of Guadalupe and she visited on several occasions during her reign. The monastery houses many valuable works, such as paintings by El Greco and Luca Giordano as well as beautiful manuscripts produced in the monastery’s own scriptorium; however, its most spectacular attraction is the Sacristy, adorned with paintings by Francisco Zurburán, who was commissioned by the monks. The painting of Saint Jerome preserved there is considered to be one the most outstanding works of his career.